The pickup: Long, spindly parsnips from the garden, their cream-colored bodies caked in dark, wet dirt. 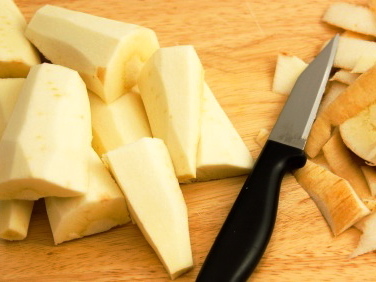 The results: Years ago, I learned the hard way — literally — that parsnip cores aren't really meant to be eaten. I peeled and chopped some parsnips and roasted them, only to be unpleasantly surprised when I tried to bite through the tough cores. Some things even roasting at high heat can't cure. But the delicately sweet flesh of the parsnip — the part surrounding the woody core, that is — makes a worthwhile alternative to potatoes or squash in the winter. These days I simply slice around the cores and cook parsnips down into thick soups or toss them into root bakes. The easiest parsnip soup I know is Russ Parsons' quick fix, Cream of Parsnip Soup, from his book How to Pick a Peach. For a more complex soup, try Deborah Madison's Parsnip Soup with Curry Spices, from The Greens Cookbook. It looks lengthy, but it ain't; the stock is made from the same ingredients as the soup, and takes perhaps half an hour longer than Parsons' concoction. Finally, if you really aren't craving something hot in the winter, try Raw Parsnip Mash, from Seattle chef Heather Andersen.